The 3,670kg module Mini Research Module-2 (MRM-2) has launched at 9:22 am Eastern on Tuesday from the Baikonur Cosmodrome in Kazakhstan on top of a Russian Soyuz-U launch vehicle. The module will become the latest addition to the Station – providing an additional docking port for Russian vehicles, an airlock for Russian-based spacewalks and a platform for external science experiments. 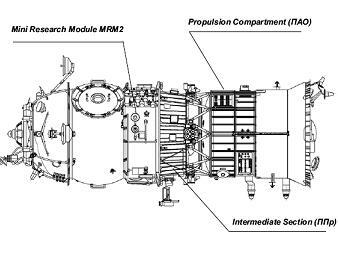 MRM-2 will be delivered to the ISS as a component of the “Progress M/MRM2” Cargo Vehicle/Module Complex, consisting of a total mass of 7,102kg. Progress/MRM2 complex will dock directly to the Service Module (SM) Zenith port of the ISS Russian Segment (RS). As outlined in NASA Flight Readiness Review (FRR) presentations (available on L2), ballistics and main flight operations specified in the flight program of Progress/MRM2 complex prior to docking to the ISS correspond to the flight program of the Progress M/DC1 vehicle/module complex. “After docking and completing certain flight operations as part of the ISS, the propulsion compartment and intermediate section will separate from the MRM2 at the interface and will perform controlled deorbit and reentry operations,” outlined one of two presentations on the MRM-2 overview. Docking with the ISS is due on the 12th, providing Station with a twin to DC-1. “Twin of DC-1; Docks using a Progress Instrument/Service Module which will be de-orbited after ULF3. MRM2/SM Zenith interface has a larger diameter docking ring then standard, but otherwise docks like a Progress,” added the ISS Agency Level FRR presentation. A docking monitoring target – for the visual monitoring of Soyuz vehicle automatic docking – has also been incorporated for this addition to Station, which will be the first docking to the SM Zenith port. “Matching units have replaced message acquisition equipment in obtaining data from sensors and preliminary telemetry processing, Computer hardware has been reconfigured by replacing matching units with terminal computers,” added FRR materials. “A different type of interior lighting devices is being used, and the caution and warning panel has been replaced by the multifunction indicator panel. “Significant work has been completed to prepare for this docking. RS EVAs 20, 22, and 23 installed the docking target, KURS antenna and cables, and relocated the docking cone respectively. The FRR materials also noted that contingency/emergency procedures are in place, in the event of a problematic approach to the ISS. A companion module, the Mini Research Module-1, is set to be carried to orbit on space shuttle Atlantis’ STS-132 mission, targeted to launch in May 2010. That module will be robotically attached to the Station’s Zarya module. STS-132 will be the 132nd flight of the Shuttle Program and the 34th shuttle flight dedicated to construction and outfitting of the International Space Station. The 11+1+2 day flight of Atlantis will utilize External Tank 136, Reusable Solid Rocket Motor set 111, Solid Rocket Booster BI set 143, and operational software OI-34. The primary payload for the mission remains the Russian Mini-Research Module 1 (MRM-1) and Integrated Cargo Carrier – Vertical Lightweight Deployable (ICC-VLD) pallet. The MRM-1 will be mounted toward the aft of the payload bay while the ICC-VLD will be berthed in the center for both launch and reentry. Packed onto the MRM-1 will be several module-specific items as well as spare parts and a portable work platform, as outlined in the PRCB baseline presentation – available to download on L2. 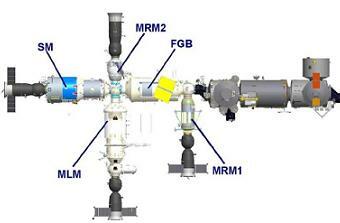 Among the various items attached to the outside of the MRM-1 will be several pieces of outfitting hardware for the MRM-1’s Multi-purpose Laboratory Module (MLM). These items include the MLM payload airlock, the MLM radiator, a spare elbow assembly for the European Robotic Arm (ERA), and the Portable Work Platform for the ERA. 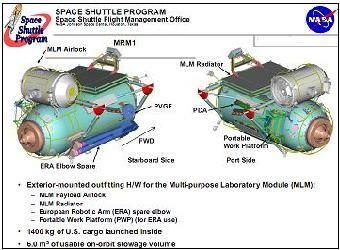 In addition to its externally mounted payloads, the MRM-1 will carry approximately 1,400 kilograms of internal U.S. supplies to the ISS. After MRM-1 is installed, the total usable stowage volume available to Expedition crewmembers will be 6.0 m3. Unberthing of MRM-1 from Atlantis and installation on FGB Nadir will occur on FD-5 (though ingress to MRM-1 is not currently planned under the initial mission timeline) and reberthing of the ICC-VLD into Atlantis’ payload bay will occur on FD-9.